You can purchase basic fabric headbands at any drugstore, but they only come in a few basic colors. If you want a hair accessory with a little more style you can easily sew your own. Making a fabric headband is a great beginner project, and it's also an excellent introduction to working with knit fabrics. Making this headband will take you about 20 minutes the first time, but you can speed up your time if you choose to make several at once. If you're buying fabric rather than using a scrap from your stash, purchase a quarter yard. This is a very basic design, which will fit most adults. 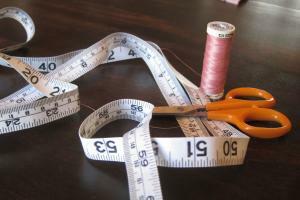 Use your measuring tape to cut a rectangle of fabric that is 18 inches long and 6.5 inches wide. Before you cut, check to see which way the fabric stretches. You'll want the fabric to stretch in the same direction as the 18-inch side. 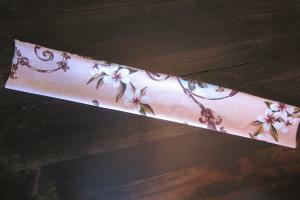 Place the fabric rectangle face-up on your sewing surface and fold it in half so the long sides are together. 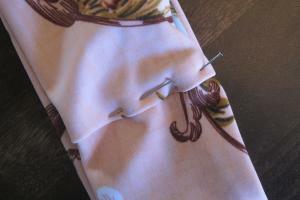 Use pins every two or three inches to hold the fabric securely. Knit fabrics can stretch as you sew, so good pinning is essential. Set your sewing machine to a zig-zag stitch. Starting at one end of the long side, sew all the way down to the other end using a half-inch seam allowance. Backstitch at the beginning and end of your seam. You now have a long tube of fabric. Turn the tube right side out. If necessary, press the tube on the appropriate iron setting for you fabric. Fold one end of the tube up toward the middle. Insert the other end of the tube into the first end. Fold over the raw edge of the first end. Use pins to hold the ends together. 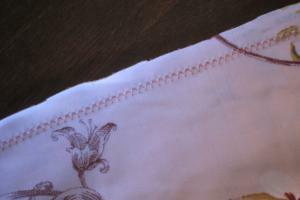 Set your sewing machine to a straight stitch with a stitch length of 3.5. 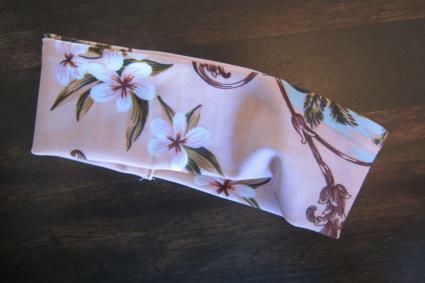 Sew right along the edge of the folded part, attaching the two ends of your headband together. Trim all threads, and then enjoy your creation. Adjust the size to fit a child by reducing the length of your starting rectangle. 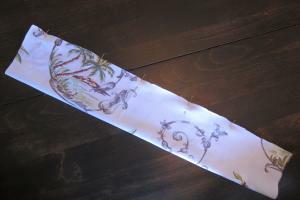 Measure around the child's head and subtract two inches to allow for the stretch in the fabric. Vary the width of the headband to get different looks. Multiply your desired width by two and add one inch for the seam allowance. Add a knot to your headband to give in more style. Cut your rectangle to 23 inches instead of 18 inches. Then before proceeding to step five, tie the fabric tube in a knot at the desired location. Finish your headband following the standard directions. Add a fabric flower to your headband after you've finished sewing it. Simply attach the flower by hand sewing it in place. Sew a fabric bow to attach to the headband after it's finished. Hand sew it on in the desired location. Whether you decide to embellish the basic headband or leave it plain to show off your choice of fabric, this is a fun and easy project. These headbands make useful gifts, and this is also a great project choice for teaching a child to sew.